Lamellar keratoplasties are evolving techniques to selectively replace diseased or opacified layers of the cornea. In recent years, the popularity of lamellar keratoplasties, especially Descemet membrane endothelial keratoplasty, Descemet stripping-automated endothelial keratoplasty and deep anterior lamellar keratoplasty, increased dramatically, since lamellar surgeries reduce intra- and postoperative complications and achieve faster visual recovery. Nonetheless, the surgical procedures are delicate. Novel imaging techniques, as intraoperative optical coherence tomography (OCT), may substantially help standardize these procedures to even further reduce intra- and postoperative complications and potentially improve outcome. The present review summarizes the current literature regarding the use of intraoperative OCT during lamellar keratoplasties and its effect on postoperative outcome. 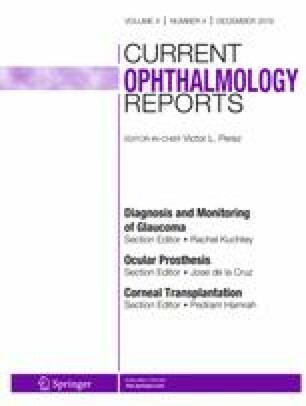 This article is part of the Topical collection on Corneal Transplantation. Kyriacos Athanasiou reports grants from NIH during the conduct of the study. Sebastian Siebelmann received a travel grant from Haag Streit Surgical. DFG FOR 2240 “(Lymph)Angiogenesis And Cellular Immunity In Inflammatory Diseases Of The Eye” (PS, CC, SS; www.for2240.de); EU COST BM 1302 (BB, CC, SS); EU ARREST BLINDNESS (CC, PS). Jerry Hu, Natalia Vapniarsky and Ashkan Aryaei declare no conflict of interest.